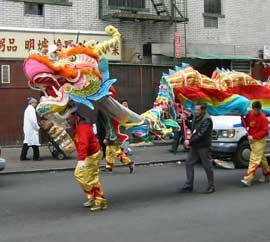 Chinese New Year celebrations in New York City. Photo Courtesy of Nathan J. Mehl. Chinese New Year, also known as the Spring Festival, is the most important and longest annual cultural celebration in Chinese culture. New Year’s Day falls sometime between late January and early February, depending on the lunar calendar. The holiday is celebrated for fifteen days.Many traditional beliefs, superstitions, and cultural practices are observed during Chinese New Year. Homes are given a good cleaning to sweep away the previous year’s bad luck. Debts are paid off. On New Year’s Eve, families gather for a traditional meal of seafood and dumplings. On New Year’s Day, Chinese put on new clothes and give to family, friends, and business associates. Married adults give lai see, little red packets containing money to children, unmarried adults, and employees. People enjoy fireworks and lion dances, believed to attract the attention of kind gods and to drive away evil spirits. Elaborate Lantern Festivals end celebrations on the fifteenth day of the New Year. Big Chinese New Year celebrations take place in the Chinatowns located in American cities with large populations of Chinese-American and Chinese residents: San Francisco, New York, Chicago, and Los Angeles, Houston, and Honolulu.